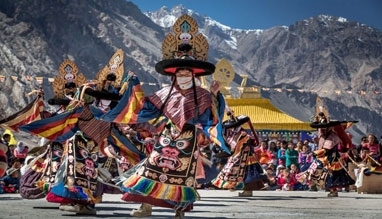 Ladakh- the little Tibet, the cold desert atop India, Ladakh offers magnificent sights and sounds that have been mesmerizing tourists, adventure buffs, trekkers and hikers over the years. 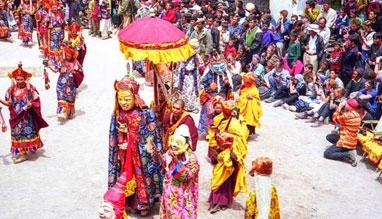 The fairs and festivals in Ladakh present an opportunity to the people to celebrate, interact with each other, form new bonds and renew the old ones- in other words they allow the people of Ladakh to stir up their otherwise still lifestyle. 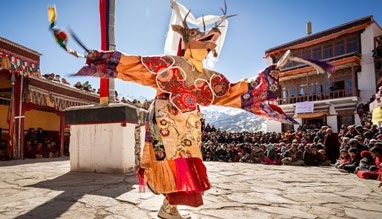 However, it is interesting to note that most of the fairs and festivals of Ladakh take place during winter and so if you want to land up in Ladakh during a regional festival, consult the Ladakh festival calendar well. 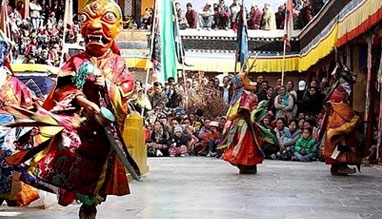 The biggest and the most popular festival of Ladakh is Hemis Tse-Chu. The festival is celebrated in later half of June or the first half of July. 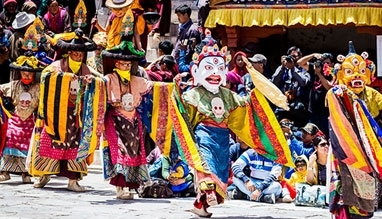 Hemis festival is celebrated to commemorate the birth of Guru Padmasambhava. 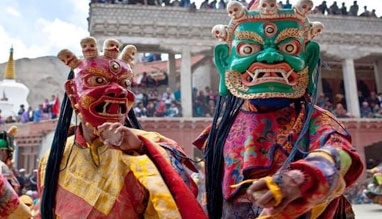 According to a legend, he fought with demons to protect the people of Ladakh. On this day, after every 12 years, a huge thangka, a religious icon painted or embroidered on cloth, is displayed. Dosmoche, is the festival of the scapegoat, and is celebrated in the second half of February to welcome the Tibetan New Year. A wooden mast is adorned with colorful silk streamers, and religious emblems and storma- ritual figures molded out of dough, are brought out to be cast away into the desert, or burnt. It is believed that these scapegoats carry away the evil spirits and misdeeds of the old bygone year and the town gets cleansed for the New Year. 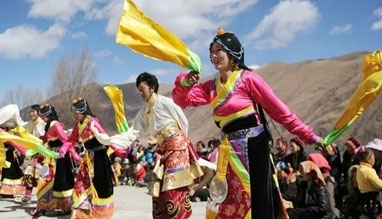 Losar festival is celebrated to welcome the Ladakhi/Tibetan New Year. There is no specific date or location for the festival. 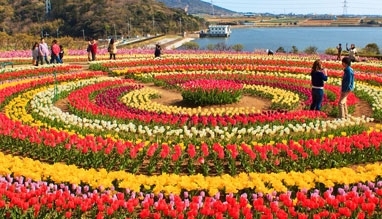 It is celebrated for 2 weeks in December or January, depending on the lunar calendar. 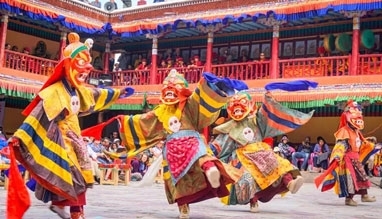 Losar sees the re-enactment of a lot of ancient rituals as a part of the celebrations like the stage fights between good & evil, dance of the Ibex deer, dramatic battles between the King & his ministers etc. 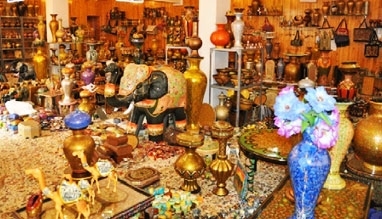 Sindhu Darshan is a festival that focuses on river Sindhu, better known as Indus. 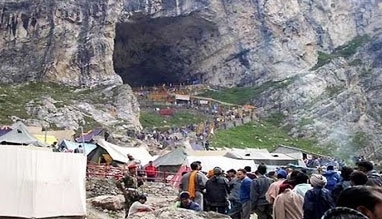 The Government of Jammu and Kashmir organizes the Sindhu Darshan festival at Leh in the month of May-June. In this festival, people come for a Darshan and Puja (worship) of the River Sindhu (Indus which is regarded as a symbol of the rich culture, communal harmony and peaceful co-existence in India). It also acts as a tribute to the brave soldiers of India who have bravely fought for their country on the international borders of the country. 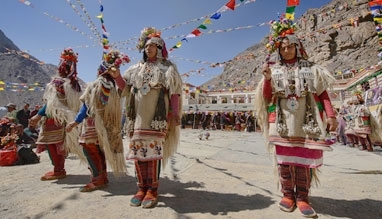 The celebrations of the Ladakh festival last for 15 days, usually from 1st September to 15th September. Music, theatre, polo, archery, mask and folk dances, showcasing of the local arts and crafts, etc are the highlights of this festival. 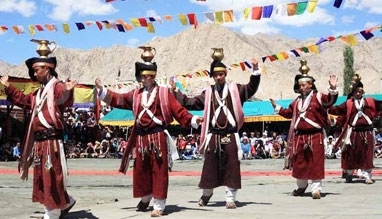 The main objective behind the festival is to revive and promote the rich culture, traditions and folk heritage of Ladakh thereby ensuring a sound tourist inflow to the region.